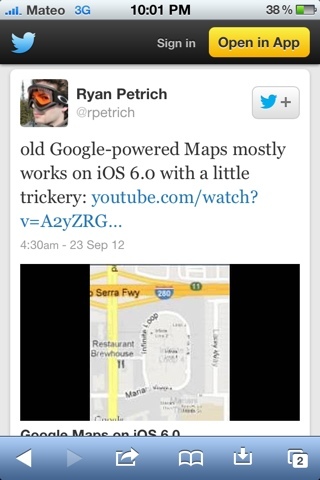 Ryan Petrich, developer of many Cydia Tweaks and applications, has successfully ported Google Maps over to Apple's latest fail IOS 6. Check out what he had to say and the video above. old Google-powered Maps mostly works on iOS 6.0 with a little trickery. The only problems that he faces is that this port requires a jailbreak (As of now IOS 6 is tethered for developers) and some IOS binaries that are not legally allowed to be distributed. At least with this port we could have our Google maps back rather than having Apple's poorly creates Maps.app that everyone seems to be having issues with. Only time will tell and we will be here to keep you updated.